Chapman has a home! 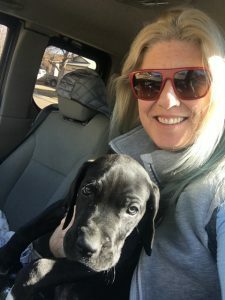 - Rocky Mountain Great Dane Rescue, Inc.
Chapman has a home with his new family, Shannon & Jeremy, in Winter Park, CO! Chapman will be the couple’s second Great Dane from RMDGRI! In 2009 Shannon & Jeremy adopted Brutus, and were looking for a sibling for him when they saw Chapman. They are over the moon excited to be welcoming a new puppy to their home! Chapman and Brutus will go to work with Shannon & Jeremy every day at the gallery they own, and meet lots of new friends. When not at their store, they enjoy being outdoors, and their property backs up to National Forest, so Chapman will grow up hiking, camping, and breathing fresh mountain air! Shannon & Jeremy live in a very dog friendly community, and all of their neighbors are just as excited to welcome a new puppy to the neighborhood! Way to go sweet boy!